Battery life—the arch-nemesis of every smartphone user. 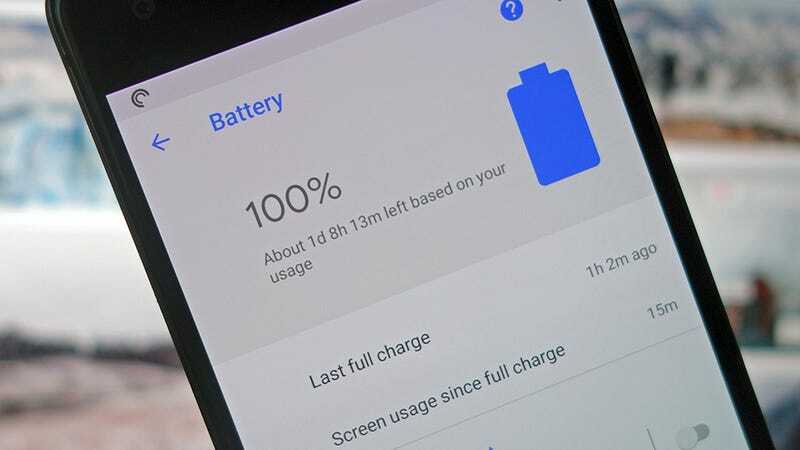 You’ve probably already realized that bingeing sessions on Netflix or afternoons on mobile Minecraft aren’t particularly kind to your remaining battery level, but there are more draws on your phone’s juice than you might think. Here’s everything to watch out. If your phone can’t get a good lock on a cell network or Wi-Fi network, it has to work harder, and use up more battery life to maintain a signal, so that you can stay connected. This is the case with both areas of weak signal and congested areas, such as if there are fifteen friends and relatives trying to get on your home network. Aside from maybe moving to a part of the country with better LTE signal, or perhaps booting everyone else off your home Wi-Fi, there’s not a huge amount you can do about this. The best option is to put your phone in airplane mode when you know you’re going to get a spotty signal. It’s not a perfect fix, but you can usually still connect to Wi-Fi (provided it’s not crowded with other users) so you’re not completely cut off. Lithium-ion batteries don’t like getting too hot or too cold—one of the reasons why a phone that overheats when charging is a red flag—so try and keep your devices away from a cold window ledge or the confines of a sealed car on a hot summer’s day. In the worst cases your phone will just shut down and stop working, never mind reduced battery life. While the effects of cold temperatures on your battery should only be temporary, regularly overheating your phone can cause a permanent drop in battery performance. Because the chemicals inside your phone’s battery are sensitive to temperature changes, it affects the energy available to your phone, which means you need to recharge more often. As you’ll know if you’ve ever used Strava or something like it, location tracking makes your phone work harder and uses up more battery accordingly. The good news is that handsets are getting better at tracking GPS more efficiently, and Android and iOS have both been improving the way that apps are allowed to ping for a location update in the background. Despite those improvements, it’s still an issue, so disabling location tracking or restricting the number of apps that can use it is one way of clawing back some battery life. Head to Settings, Security & location, Location and App-level permissions on Android, or Settings, Privacy and Location Services on iOS to make changes on an app-by-app basis. This is another area where modern handsets are much better than phones of yesteryear—when it was best to drain a phone as much as possible between charges. Now shallow discharges are better for the long-term health of your battery than charging it all the way to the maximum then letting it fully discharge each time. Ideally, you want to be running at levels of 40-80 percent battery as much as possible. Of course that’s not really practical unless you’re always in reach of a power socket and have the time to constantly monitor the battery level on your handset, but it’s something to consider if you want to extend the time you get with your phone before the battery life drops off a cliff. And if you’re not using your phone for a while, turn it off at 50 percent. After the power drawn by the miniaturized communications equipment in your phone, the display is the second-biggest threat to a healthy battery life level—and as those displays get bigger, with smaller bezels and more pixels, they need more power to run. If you can switch your display off more often, or check your phone less often, it makes a difference. No doubt you’ve heard that dimming your phone’s brightness saves on battery life, but the savings are bigger than you might realize, so give it a try on your own handset. You should also reduce the time it takes for your display to switch off. All of these settings can be managed under the Display or Display & Brightness menus in your phone’s settings app. This one is either going to be obvious to you or something you’ve never even considered: Louder audio pulls more power from your phone’s battery, though the differences aren’t usually huge, depending on the draw of your handset’s speakers. Hitting the mute button or investing in a pair of headphones is another way to extend your phone’s battery life. It’s not just music apps you need to think about either when it comes to audio—there’s the sound that goes along the stuff you watch on Netflix and YouTube, and all those autoplaying videos that pop up in Facebook, Snapchat, and Instagram. Across all your apps, audio playback is one of the key battery-draining usage types that iOS looks for. Finally, you probably don’t need us to tell you that your apps are hitting your battery life as soon as you open them. You can find out who the worst offenders are: open up the Battery menu in Settings on either Android or iOS to see a list. If one particular app really sticks out, maybe try and work out why, or see if an updated version is available. As we mentioned above, both Android and iOS now have very competent battery management tools, restricting what idle apps can do in the background and getting even stricter when battery levels are low. You can always access these and enable them manually if you need to through the battery screens off the main Settings apps. Which Apps Are Running Down Your Chromebook&apos;s Battery?